The name Joe Rolfe may mean nothing to you, and that's not surprising, for it's 82 years since it last decorated the sporting headlines and billposters of London. In the 1920s it was a name synonymous with gameness, sportsmanship, fighting skill and a fearsome right hand; a name bellowed loudly all around the south London district of Bermondsey, a place famed for its docks, its tanneries, and its fearless fighting men. Joe Rolfe started life there on 20 December 1901 with the given name of Joseph Olliffe. Aged eight he joined Bermondsey's renowned Fisher amateur boxing club, he married early at age 16, but to his dismay found work on the local docks hard to come by. It was through sheer necessity that he decided to turn pro, and attempted to get himself onto the bill at the famous Covent Garden National Sporting Club (NSC), which at the time ran novices' competitions in support of the main bouts. Joe easily stopped his first and second tourney opponents inside a round, and a week later respectively stopped and outpointed his quarter and semi-final opponents to win a place in the final. This he easily won with another first-round stoppage, to scoop £10's prize money along with the prestige of winning an NSC tournament. Having proven a heavy puncher Joe was readily booked for another NSC bill, on which he knocked out Lambeth's Tommy Williams in one round. Punchers, then as now, were big box-office draws, and so, sensing Joe's audience appeal, the NSC's owner Arthur 'Peggy' Bettinson promptly signed him under contract and hired Bermondsey coach Arthur Goodwin to train him. Joe notched up a string of wins but then lost to the experienced Fred Archer. With several good victories he edged towards a British welterweight title shot, but dropped decisions to future middleweight champ Alex Ireland and Castleford's Billy Mattick, whom he KO'd in a return. He then fought for a career-best purse of £300 against future two-weight British and European champion Tommy Milligan, but was stopped in nine rounds. Up at middleweight Joe again came close to a title shot but had the misfortune to box at the same time as all-time British greats Jack Hood and Len Harvey, who both defeated him. Although he never captured a British title, Joe had many outstanding memories of his time in the ring. 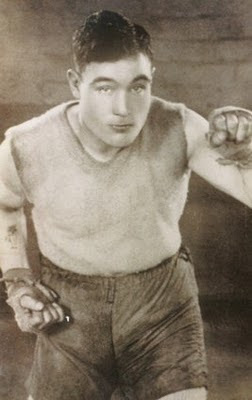 He was seconded in his first fight against Billy Mattick by the great Jim Driscoll at the NSC, and served as a sparring partner to the legendary world middleweight champion Mickey Walker, who had travelled to Britain from America to defend his title against Tommy Milligan. In later life Joe was a regular at the Thomas A' Beckett gymnasium on the Old Kent Road. He enjoyed the atmosphere of the gym, and although he could pick out faults in a flash, was too polite to ever interfere. He recalled the best fighter he saw was Ted 'Kid' Lewis, and the best boxer Len Johnson of Manchester. Joe Olliffe – better known as Joe Rolfe – passed away in 1972, still revered all over Lambeth by those who fondly remembered his fighting days. Though Joe and his Bermondsey contemporaries died off long ago, an invaluable piece of film gives us some idea of what life was like for the boxers of their generation.